Each week, on the Inside the Huddle podcast, Neil and Jeff make their predictions for every NFL game, keeping a tally of their records as the season goes on. 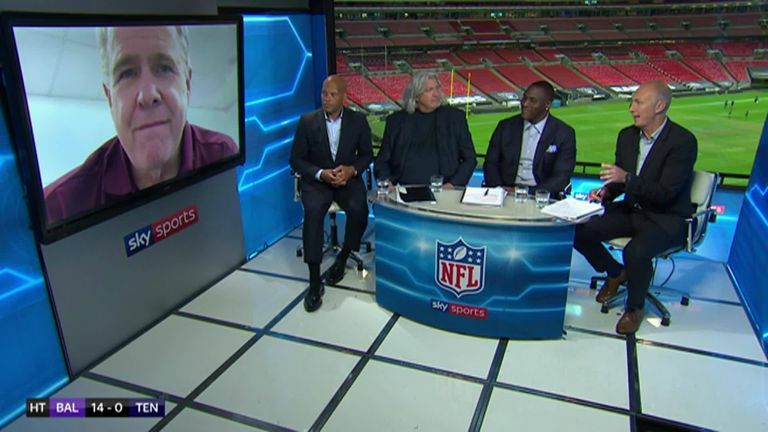 Inside the Huddle is broadcast weekly on Sky Sports and available On Demand. I like a lot of what I'm seeing from the Chargers at the moment. To me, they have everything you need to be a Super Bowl winning team, especially when they get Joey Bosa back on the defensive line. I'm picking them to win at Wembley. I feel sorry for Philip Rivers. No one really appreciates just how good that guy is. He now has some weapons around him, a good defense. This team is primed to make a run. I'm picking Minnesota to win on the road. They're getting their ground game going at the right time. Todd Bowles, head coach in New York, is doing a phenomenal job with a team that is under-powered. They have a good young quarterback in Sam Darnold, have given him some weapons and they run the ball well - I love Bilal Powell - but I just think the Vikings are a better overall football team. This is an interesting one. There's not a lot between these two teams, both coming off big wins last week, both inconsistent. I was thinking about Washington, and leaning that way - they need to get Adrian Peterson involved as they're 3-0 when he rushes for 90 or more yards - but I'm going to back Dallas to win on the road. This is such a huge rivalry game! Because the game is in Washington, and because the Cowboys have not played well on the road, I'm going to take the Redskins to win a real physical one. I think the Chiefs bounce right back. As they walked off the field after defeat to the Patriots last week, Peter King, who joins us on the show on Sunday nights, said the Chiefs "weren't angry or down". This is a team that were confident they had New England in the second half and is eager to see them again down the line. How can you go against the Kansas City offense? They are just incredible! A young quarterback in Patrick Mahomes goes toe to toe with a future hall of famer Tom Brady on just his seventh start in the NFL. That kid is special. Also, to me, Travis Kelce is the best tight end in the NFL right now. I know Rob Gronkowski is still making plays, but I just think Kelce is so dynamic, can do so many things. I'm going to tell you that former Giants head coach Ben McAdoo was right all along, benching Eli Manning last year. He looks done at the moment. If I was in New York, I'd find a way of getting Saquon Barkley the ball as many times as I can. You can talk all you want about Odell Beckham Jr - yes, he has a nice haircut, is a great interview and can catch the ball with one hand - but, in this business, it isn't about all that stuff. That's for marketing guys. In football, it's about winning, about production and, right now the best player on that Giants team is Barkley. If he doesn't touch the ball 25 times or more in the game, they can't win, got no chance of winning. Rant over now. This is a big game for Broncos coach Vance Joseph. General manger John Elway, for the second year running, has called out his own defense as being "soft". Joseph is on the hotseat, but I actually think his team responds and win on the road. When you have your best player, Von Miller, come out and say "we're going to kick their a**", I think it means the message got heard. Take the Broncos.